How far are we from Yesterday? “Every passion borders on the chaotic, but the collector’s passion borders on the chaos of memories”. “…ownership is the most intimate relationship that one can have to objects. Not that they come alive in him; it is he who lives in them. So I have erected one of his dwellings, with books as the building stones, before you, and now he is going to disappear inside, as is only fitting”. Author nathaliejolivertPosted on November 14, 2011 January 23, 2012 Categories Literature, Spatial NarrativesLeave a comment on How far are we from Yesterday? I took advantage of the break to edge my way into the crowd. The carnival bands had completely taken over every meter of the square. As had previously been announced, the most renowned ones from the South East were there. The musicians and dancers seemed to be camped out for the moment amidst their sleeping instruments; different types of drums, bamboo horns, conch shells, rattles, saxophones, flutes, cones, accordiaons. Here adn there, under the trees, while eating and drinking, the Jacmelians began to tell stories. Concerned with the lack of governance and citizen participation in Haiti, and having experienced the same issue in the US by attempting to work in various voluntary groups, it has always interested me to create spaces that would encourage civic participation. The “Architecture of Participation” is currently used to describe the way in which people are connected via the 2.0 network. At first, my research consisted in building a website for people to share their experiences, in different places of Haiti and provide their views on how they think they could improve those places. A friend of mine listed my school projects to help me find the usual focus of my work. With this exercise, we found out that my work promotes little physical intervention. It deals with bringing people together with subtle urban and landscape schemes, or with a flexibility of space, with porosity and playfulness of space. What has sparked my interest is the use of technology to create meeting places, with little physical/material intervention. Technology has helped generate many pop-up demonstrations and has been used to bring people together to either fight against a system or for pure fun. For example the ‘Dinner in White’ is an event, started in Paris, that brought people together for a large picnic in an undisclosed public place. The only requirement is to sign up for the event and wait for the location, the picnic day. Inspired by this spontaneity of wanting to commune, my interest to bring people together for meetings in a transparent, flexible space, have led me to a space of congregation, generator of ideas and platform for cross-cultural exchange. 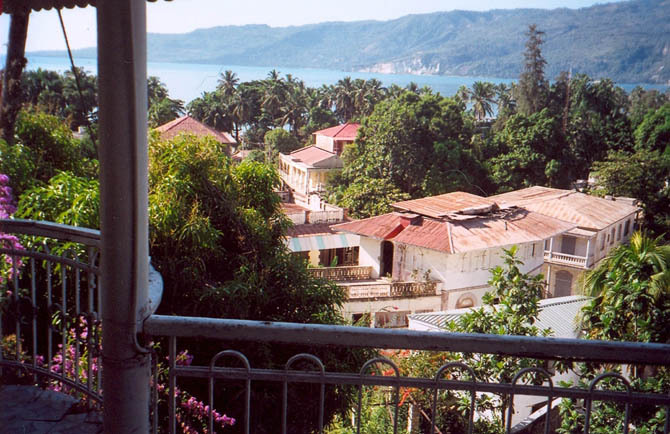 Jacmel’s Resident Goddess is Hadriana Siloe. One of the most beautiful women in town, Hadriana dies at the altar in the middle of her wedding ceremony. Her body is exposed at the square for a public wake before her funeral. Except she is not dead. It only apears so. Her apparent demise was caused by a man with mystical powers who whows himself as a giant butterfly. Hadriana becomes a zombie. This is the premise of René Depestre’s Hadriana dans tous mes rêves (Hadriana in All My Dreams), a celebrated novel set in Jacmel. Born in Jacmel in 1926, the poet-novelist Depestre is one of Haiti’s most prolific and best-known writers. The winner of several prestigious international prizes, he is considered by some to be Haiti’s best shot at a Nobel Prize. Even though he has been living outside of Haiti for more than forty years and has never returned, Depestre draws upon childhood memories of the 1938 carnival season for his 1988 novel, and in it he has created a character that lives far beyond the pages of his book. Hadriana is one of those rare literary cases in which a novel’s character becomes even more real, and more powerful, than actual people. For many Jacmelians, including Divers, even powering her existence parallels the question that many agnostics ask themselves about God. Did we create God or did God create us? Did Dépestre and Jacmel create Hadriana or did she create Jacmel and Dépestre? Upon the initiative of First Lady of Azerbaijan, Mehriban Aliyeva, of the UNESCO Good-Will Ambassador Mehriban Aliyeva, Azerbaijan will assign $50,000 to the efforts to restore cultural facilities of the city of Jacmel. The project is to start this December and last six months.